It was strangely quiet on Monday morning at Fradley Junction: granted, before 10am it was too early for either gongoozlers at the locks or drinkers at The Swan. The shop beside the pub was open though – and there’s been a transformation in recent years. The emergency grocery stock is still small but the range of canal influenced souvenirs is huge. Upstairs, displayed against white walls and under timber beams, are more pictures and gifts. “The caravan people seem to like cream colours,” explained the lady in charge, as marketing words like ‘footfall’ and ‘commissions’ crept into the conversation. If you’re passing Fradley consider dropping into the shop, pop upstairs to the tea room and from a window table you’ll get a grandstand view of all the action. “Oh, we get people falling in, people not being able to handle the boat, gongoozlers, all sorts,” said the lady. Back at Cleddau the Captain was ready to go. But Sniff… sniff! Around the front deck swirled a hint of gas. Detection. Gas was leaking from one of the gas bottle tubes or couplings. The arrangement was made safe and the day’s cruise could be started. On a boat of mature age when something (else) needs replacing you think back to how old it might be. Circa 1997 for gas tubes, from the Willowbridge, Bletchley period, was the conclusion… An hour or so along the Coventry Canal lies Streethay Wharf. at its bow end. Tubes swapped the Captain proudly smirked “And the gasman came to call,” before reeling off a litany of his recent boaty achievements (sourcing and sorting the engine room rainwater leak, installing a temporary radio aerial in the bedroom). through Hopwas to Fazeley Junction. Here regeneration is much in evidence..
it was straight on for Tamworth, over the River Tame and along to the two Glascote Locks. “We’re going UPHILL now,” remarked the Captain. 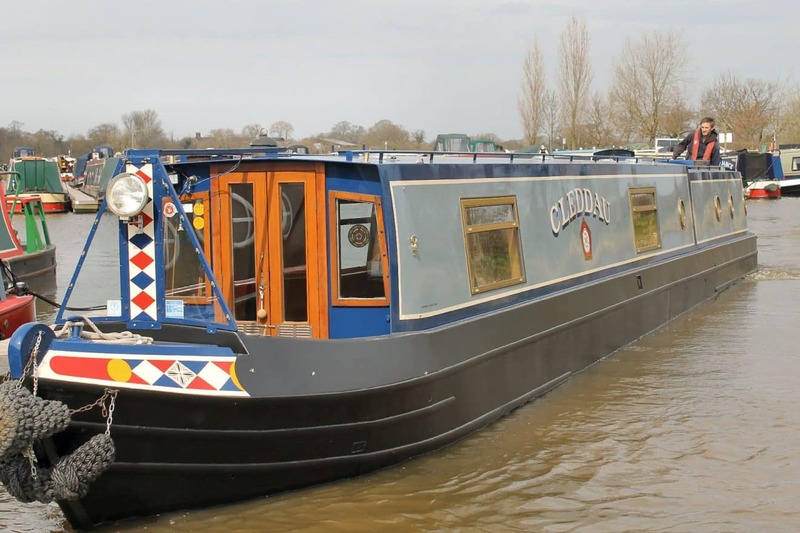 “It’s been downhill since we left.” Ahead was a newly painted boat, picked up just two days before at Great Haywood, gingerly being moved to London as a home for its young owners. On through Tamworth, past quirky gardens and all manner of sodden garden seats, eyes open to spot this intriguing ornament. 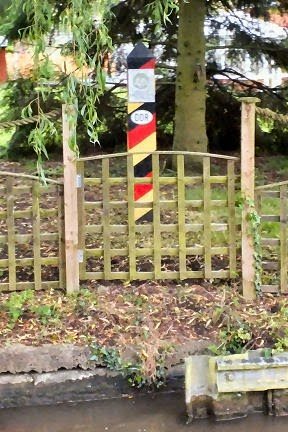 Just how did an East German border post come to be sited in a Tamworth garden…? home of hire boats, private boats and old work boats. representing the sun’s conversion of leaves and trees into coal. red poppies on field boundaries. – but easy mooring close to the town between locks 6 and 5. First digital job each evening now is to send a position report to nb Tentatrice. Here it is: do not accuse the Captain of unnecessary verbosity! Tomorrow, towards Hawkesbury Junction (Coventry outskirts).